I set out to make a colorful quilt with plenty of white space for my bedroom. I knew I wanted to include triangles in the design, but wanted to keep it fairly simple. Originally, my thought was to have three rectangular blocks of triangles. I liked the idea of having one column of triangles in each block with the background and foreground reversed. But, what seemed great in my head and looked promising on sketch paper felt sort of heavy and static when I laid out the fabric triangles. A little playing around and I came up with the big triangles. This design has the right balance of white and color that I was looking for. The colors are unusual for me, but I love how cheerful they are. I used a print from Leah Duncan’s Meadow collection for the backing, with a little bit of orange at the top. The binding is from Carolyn Friedlander’s Architextures collection. I like how the gray adds a dash of sophistication to the palette. 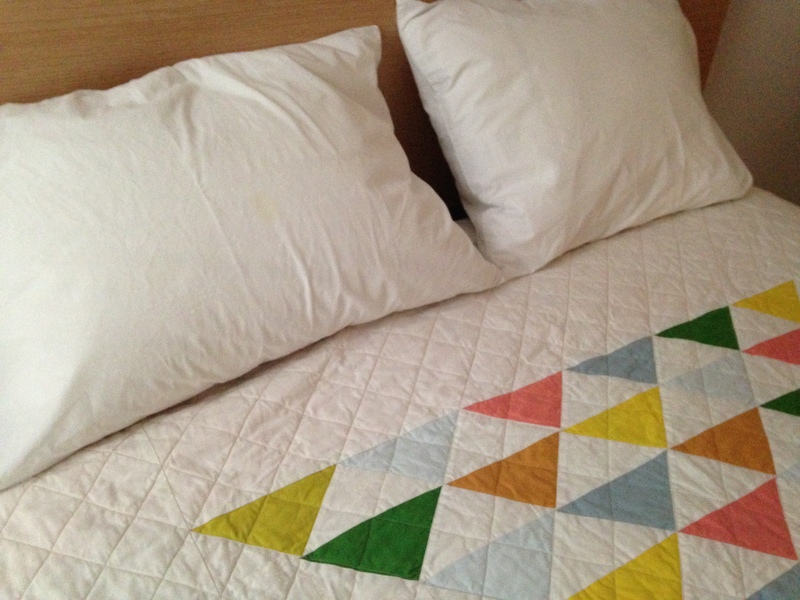 I quilted using the diagonal edges of the triangles as guides to create a grid. I was really pleased how the quilting lines create a sort of argyle effect. 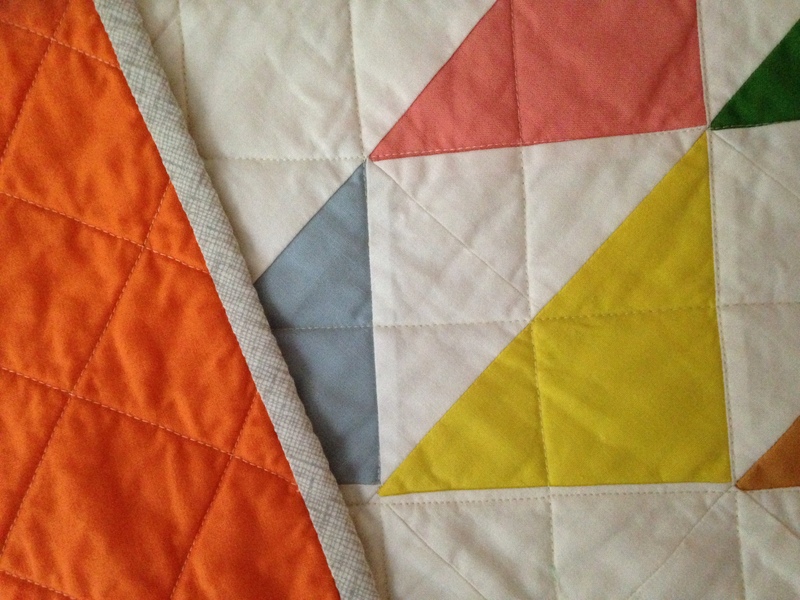 The lines are spaced two inches apart, which gives the quilt a really soft and cozy feel. 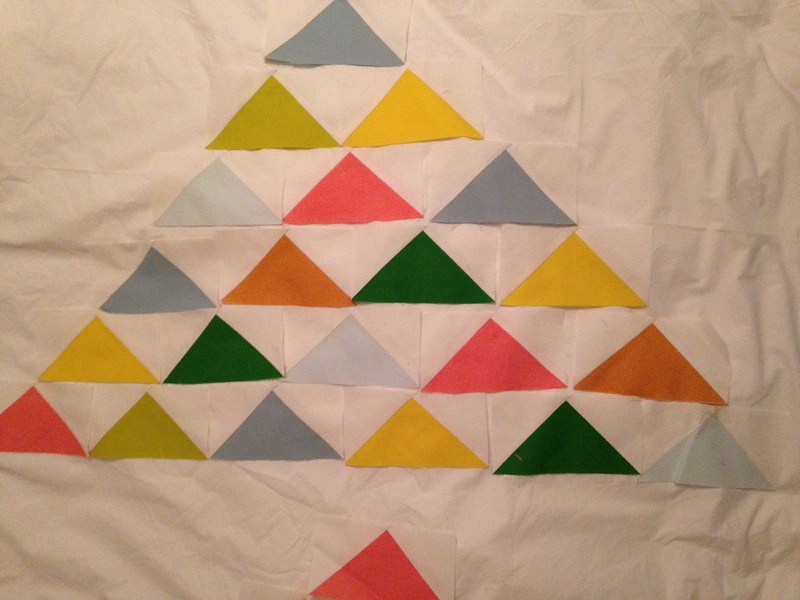 This entry was posted in fabric, quilts and tagged flock of geese quilt, flying geese quilt, modern triangle quilt, triangle quilts on July 15, 2014 by brigitdermott. Thanks for pinning my quilt–I am already a follower of your quilty goodness board–I love it! We seem to have very similar taste in quilts. It’s gorgeous! The quilting is just right. Thanks, Vicki! I just took a peek at your blog and you do lovely work! Any chance there will be a pattern for this? I love it! Yes! I am working on the pattern right now. It should be done and up in my etsy shop in about two weeks. Thanks for asking! I’ll post when it’s ready. I just wanted to let you know that the pattern for this quilt is now available in my Etsy shop. I am also running a give away on the blog so please enter to win a copy! Thanks, Alison. I love the name of your blog! Thanks, Judy! I just took a peek at your blog. 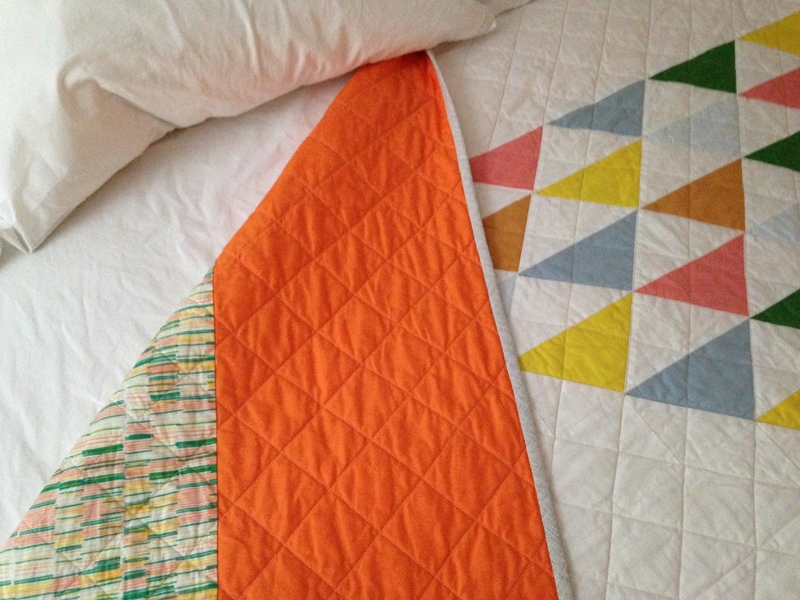 I love you plus quilt–I’m a big fan of Carolyn Friedlander and your design works so well with her collection! Thanks, Meg! I think it might be my best, too! I am going to make a baby version in navy. One day I will make you a quilt–at least a throw size! 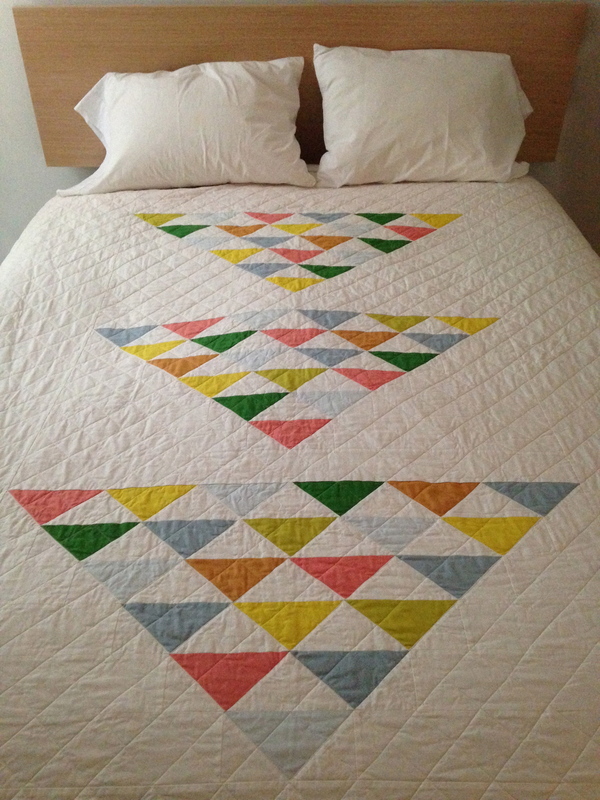 Love the argyle effect from the quilting interplay with the triangles, too! Well done and very sleek. It looks great on your bed! These are my fave colors! Are you certain it wouldn’t look better on my bed? I love all that white with a groovy backing. It’s your best, I think!